The Bentley Continental GT is a tasty slice, a tasty slice that we actually prefer in the V8 trim instead of the W12, even if it makes 67 less horsepower. 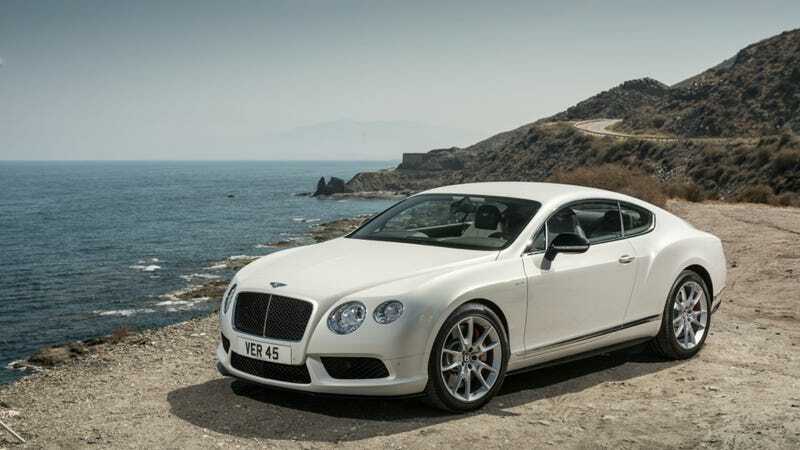 But now Bentley is trying to bridge the gap with this, the new Continental GT V8 S.
Think of the S as the Speed version of the V8-powered Continental GT. You get 21 more horsepower for a total of 521. It also has a retuned suspension and the Conti GT body you know and love. So what does this mean for performance? In over-the-top Bentley terms, the S is "more dramatic" and a "sensory overload." In Germanic numbers, the S Coupe gets to 60 mph in 4.3 seconds, while the cabriolet takes 4.5 seconds. The suspension is slightly lowered and springs are lightly stiffened. But don't expect that the Conti GT has now become a Porsche 911. Bentley is emphasizing that the GT S is still a grand tourer of epic proportions, so don't start taking your Bentley to track days. Well, actually, take your Bentley to track days, that'd be awesome. And I'm betting this is the one you'll want to take.